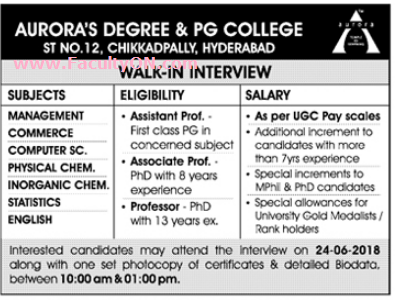 Aurora's Degree and PG College, Hyderabad has advertised in the DECCAN CHRONICLE newspaper for recruitment of Professor / Associate Professor / Assistant Professor jobs vacancies. Interested and eligible job aspirants are requested to apply on or before 24th June 2018. Check out further more details below. About College: Aurora's Degree College has carved a niche for itself over a period of two decades. Our relentless effort in imparting quality education through participatory teaching methodologies and pedagogical tools helped in chiseling personality of students. How to Apply: Interested candidates are requested to attend the Walk-in interview with updated CV along with one set of photo copies of certificates and recent passport size photos to the walk-in address provided below.